‘Tis the season and I want to make the most of it. 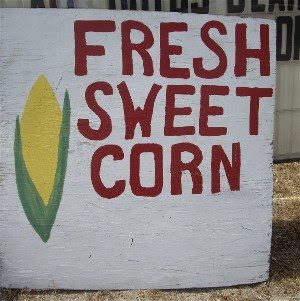 I’ve heard that boiling corn with a splash of milk makes it extra sweet. Do any of you have corn cooking tips or favorite recipes? My mother’s method is foolproof and simple and for some reason many people are resistant to it. Fill a pot with cold water about 2/3. Add shucked corn. Turn heat to high. When the water reaches the boil, the corn is ready. I cook corn off the cob in a light sauté with butter, Persian lime olive oil, and cilantro. Salt and pepper to taste. You could also add halved cherry tomatoes and some kind of bean—my most recent version had yellow wax beans. Romanos are also excellent. You could also do lemon olive oil with cherry tomatoes and basil. Heavenly! Wow. Yum to you both. Toss the kernels in a large bowl with the red onions, vinegar, olive oil, salt and pepper. Just before serving, toss in the fresh basil. Don’t get me started on corn! I’m from Ohio, doncha know. But I do know you need TWO essential, for perfect COTC: Plastic corn-shaped corn cob holders, and a Butter Boy.